New book, 88 pages, SS5721. 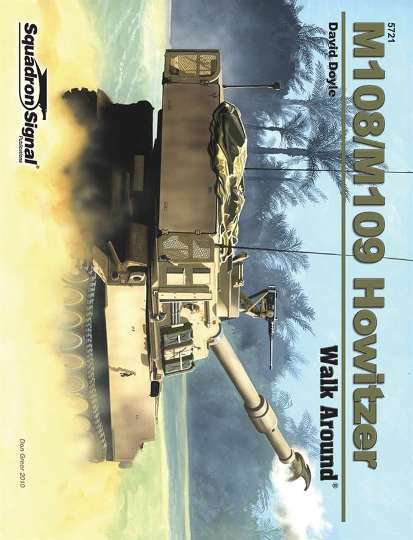 Introduced in the early 1960s, the M108/109 marked the transition from open-topped to fully enclosed self-propelled artillery. Developed simultaneously, the M108 and M109 went from experimental to 'standard' classification in July 1963. Production of the M108 was concluded within months, as its 105mm gun was found to be less well-suited than the M109's 155mm cannon. Both vehicles saw service in Vietnam. In 1972, the M109s were rearmed with longer barrels resulting in the M109A1. Various modifications were introduced in subsequent years, and in the mid-1980s the M109 family was upgraded to include nuclear, chemical, and biological protection - those modified units being redesignated M109A4. Then in February 1990, a version incorporating enlarged turret, improved armor and armament, increased ammunition stowage, NBC protection and microclimate for the crew became available under the designation M109A6, the 'Paladin,' a thoroughly modern weapon able to go from road march to pinpoint firing in less than 60 seconds. Illustrated with more than 315 photographs, plus color profiles and detailed line drawings.